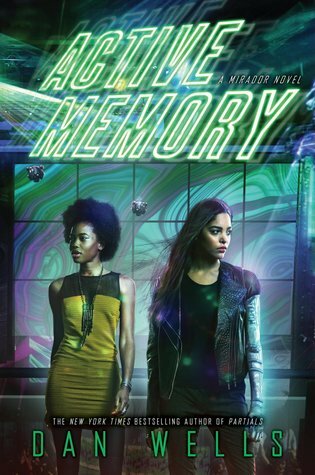 4.5 Stars'Active Memory' is the mesmerizing third book in a young adult science fiction/dystopian series that will leave readers begging for more. It continues to follow our main character, Marisa, as she and her friends find themselves in more trouble and with even more questions than before. It seems that if Marisa wants to learn the truth about her past, it's going to cost her (and many others) a lot more than she ever thought.This book was amazing, just like the other two before it. Every single aspect was expertly done, and if I had to think of something that didn't blow me away, I would have to go with the author's use of the third person point of view. Don't get me wrong - it worked great for this book and only slightly bothered me and my reading experience. I'm just a huge fan of first person POV and the deep connection that the reader can develop with the narrator. Other than that personal opinion, this book exceeded any hopes or expectations I might have had. I've read the previous two novels in the series along with several other books by the author and have adored each one. This was no exception.The characters were all well written with distinct personalities, especially our main character, Marisa. The secondary characters were decently well rounded, and we continue to get to know them more with each installment. The story line wasn't wholly unique - which is pretty much impossible to do these days anyway. The thing that made this novel stand out for me was the incredible world building. Since the story takes place in the not so distant future (around the year 2050), a lot of the objects and situations were familiar - so it didn't feel unrealistic or out of the question. When we're introduced to all the new technology - like the djinni, for example - it didn't feel like it was out of the realm of possibility. I could actually see a world like this in the future, which made it so much cooler and fun to think about - as well as to picture in my mind. Because of the natural blend of present and future societies, I found myself slipping inside Marisa's world right from the very first page of the book - and I didn't come back out until the very last word. I could go on for a long time about all of the various technology and changes that are in this future world, but that still wouldn't be able to convey all of the sheer awesomeness. The pace was pretty steady at first and then picked up speed as the plot thickened and things got crazy. By that point I was reading as fast as I could to see what was going to happen. I can't wait to see where the story's going to go and what all might happen. With the author's immense storytelling abilities, I know that this series is going to continue to be amazing. Very highly recommended for fans of YA, science fiction, and dystopian fiction! !Disclosure: I received a copy of the book in exchange for an honest review. "The past is in the past, It can't hurt you unless you let it. So we're not going to let it. "This book was amazing, just like the other two before it! I really love Dan Wells writing style and can't wait to check out his other series!Marisa and The Cherry Dogs are back at it again hacking their way through the world wide web. This time Marisa is finally finding out things that we have been wondering since book one. Why was she in the car with Omar's Mom fifteen years ago!I definitely didn't see the truth arising by the police finding Zenaida de Maldonado’s FRESH severed hand at a crime scene. So Marisa and the gang are on a mission to find out did Zenaida really die or not fifteen years ago. While on their mission they uncover even more secrets connecting her and Zenaida to the world’s most powerful genetic engineering firm.Along the way Marisa gets a little help from the Mob and her brothers gang which got pretty interesting. Which also leads to more of Omar, which Marisa might start to have feelings for!? What about Alain! We won't know because sadly he isn't in this one, but I have a feeling he'd be in feature books. I really hope so! Please tell me there's more books! I'd love to read more of this world! "He stopped, and turned toward her. His eyes were as dark as onyx, and she was suddenly struck by the way he looked at her - intense and probing, like was looking at her and into her and through her all at once. "There's also some new obstacles"And I definitely don't want her to tangle with me." "The Wonder Mantis", said Sahara. "The WoMantis," sad Marisa. " The Mantissassin," said Sahara. "With those names you can only imagine what to expect from that person.The ending was bittersweet, but I think perfect.“Be yourself, because it's obviously working well for you, but don't be yourself so hard that you forget to be the kind of self that other people need." If you are into Science Fiction, and especially if technology and mystery intrigue you, this is quite a read! The third book in the Mirador Series follows Marisa as she (okay, WE) finally comes face to face with the one mystery that has plagued and eluded her. The truth behind her arm and Zenaida, a mob boss' wife, who was said to have died in a car accident with her youngest son and Marisa in the vehicle.I noted this leaned more towards "real-life" versus the gaming world of binary and coding where Marisa is a part of a team, The Cherry Dogs, in the Overworld Games; One's and Zeroes delved into this. While I did read Ones and Zeroes prior to Active Memory which I received for a book tour, I have not read Bluescreen. Wonderfully written for different genres: YA, SciFi, Mystery. My twin teens would (and will) enjoy these books as they are "clean". Active Memory brings to the fray more mystery with a lot of running and gunning from the Russian mob family, Severov, who used to control territory in the neighborhood Mirador and fought the Maldonado's for it. Once again the friendships of the main characters are there, but not as heavily as the other books. While I was completely satisfied with the ending, Dan Wells leaves the door slightly ajar for another book in the Mirador Series, we shall see. I am so enthralled by Well's dystopian world! I wouldn't want to live there, but Wells captures so perfectly the future I worry about dressed up in amazing technology. The villain was especially terrifying and cool all at once. I really hope this isn't the last of Marisa's adventures, because I'll never stop wondering about her. Love this series. In this book we learn about Marisa's backstory that has only been hinted at in previous books. She and her friends are awesome!! great pacing, great characters, great dialogue- don't miss the series! Dan Wells - Dan Wells is a thriller and science fiction writer. Born in Utah, he spent his early years reading and writing. He is he author of the Partials series (Partials, Isolation, Fragments, and Ruins), the John Cleaver series (I Am Not a Serial Killer, Mr. Monster, and I Don't Want To Kill You), and a few others (The Hollow City, A Night of Blacker Darkness, etc). He was a Campbell nomine for best new writer, and has won a Hugo award for his work on the podcast Writing Excuses; the podcast is also a multiple winner of the Parsec Award.